Almasi Kashi, M., Ramazani, A. (2010). Ordered Nanoporous Alumina Membranes Formed in Oxalic/Phosphoric Acid Using Hard Anodization. International Journal of Nanoscience and Nanotechnology, 6(2), 78-87. M. Almasi Kashi; A. Ramazani. "Ordered Nanoporous Alumina Membranes Formed in Oxalic/Phosphoric Acid Using Hard Anodization". 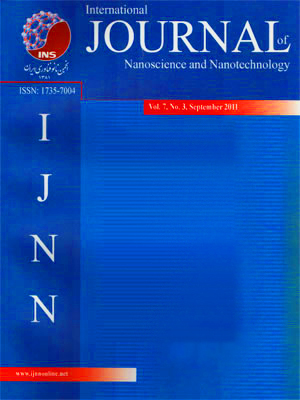 International Journal of Nanoscience and Nanotechnology, 6, 2, 2010, 78-87. Almasi Kashi, M., Ramazani, A. (2010). 'Ordered Nanoporous Alumina Membranes Formed in Oxalic/Phosphoric Acid Using Hard Anodization', International Journal of Nanoscience and Nanotechnology, 6(2), pp. 78-87. Almasi Kashi, M., Ramazani, A. Ordered Nanoporous Alumina Membranes Formed in Oxalic/Phosphoric Acid Using Hard Anodization. International Journal of Nanoscience and Nanotechnology, 2010; 6(2): 78-87. Highly self-ordered alumina nanopore arrays were fabricated using hard anodization technique in different mixtures of oxalic/phosphoric acid. The phosphoric acid concentration was varied from 0.05 to 0.3 M while the oxalic acid concentration was changed between 0.3 and 0.4 M. The self ordered nanoporous arrays were obtained in anodization voltage changing from 130 to 200 V. The interpore distances ranging from 270 to 500 nm were achieved. The interpore distance of the ordered samples was dependent upon the both anodization voltage and current density. The current density increased by increasing the anodization voltage that may be a reason to reduce the interpore distance from 2.2 V to 2.1 V. The best self ordered porous alumina oxide were obtained with 160, 165, and 185 anodization voltages, using different values of oxalic and phosphoric acid concentration. It was obtained that increasing the oxalic acid concentration in the electrolyte along with reducing the rate of anodization voltage controlled the hard anodization treatment such as better self ordered arrays.